As those of you who follow me on Instagram know I have been running while on holiday in Lanzarote. If you do not follow me on Instagram why not? Running while on holiday may sound easy, but for me in the past I have found it difficult for many reasons. It can be difficult to get up early in the morning while on holiday, for me in the past that is usually because I have eaten and drunk to much the evening before. This holiday however things were different my Brighton Marathon Training plan was due to start on my final day of holiday. As you know The Brighton Marathon 2019 is my goal race to help get me back into running and to become fit again. There is currently 18 weeks until race day. 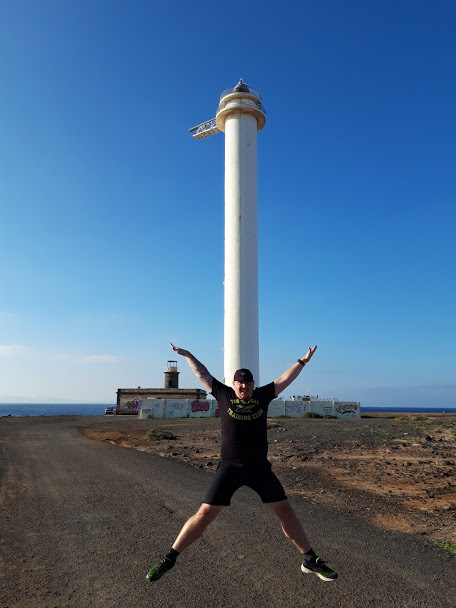 I do not just want to run a marathon I want to enjoy running again and while in Lanzarote and running while on holiday, the fire has been ignited. 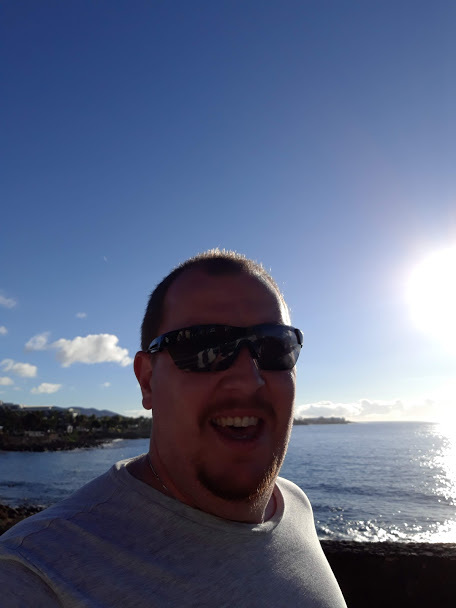 In total I was in Lanzarote for only 7 days and ran 3 times. Throughout the rest of this post I will give you a quick review on each of those runs. 3 Miles Along The Seafront. 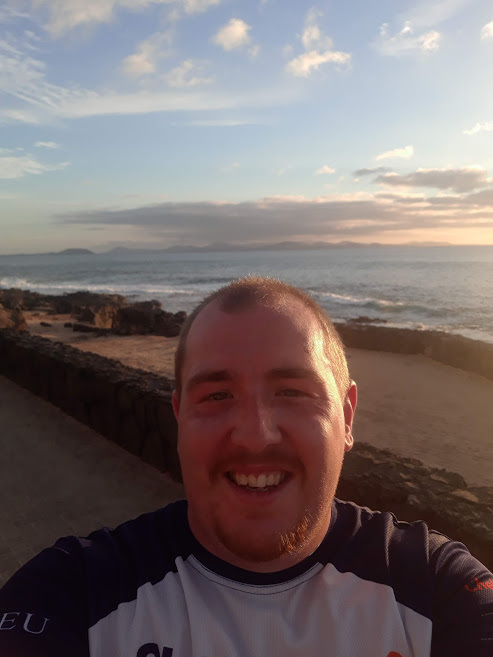 My first run in Lanzarote was a 3 mile run along the seafront of Playa Blanca. All day I had been delaying this run and eventually at just before 4 in the afternoon I laced up my trainers. I was joined by ‘Lady JJ Miles’ who runs faster than my current pace. We left our accommodation and ran along the seafront, The air was still warm but there was a slightly cooling breeze blowing from the sea. The first mile was faster than I would have liked considering the temperature. Due to ‘Lady JJ Miles’ being faster than me at the moment I tried to hang onto the pace. After the first mile we settled into a pace we could both agree with. At 1 and a half miles we turned and started heading back towards our accommodation staying on the sea front the final 2 miles were at a consistent pace. Too Hot And Too Tired. I finished the run hot and tired we had finished right next to the beach and decided to go into the sea for a little swim cool down. Usually I cool-down by walking and stretching post-run, a swim on this occasion is exactly what was needed. I only swam for 10 minutes but I felt so fresh afterwards I felt like I could go and run another 3 miles. I managed to see sense and realized quickly that even though I enjoyed my run I shouldn’t do too much too soon. Because of this I decided to only run 2 miles the next day. On my Facebook page I conducted a poll asking whether I should run in the morning or the evening the next day? The poll was 100% in favor of a morning run. I set my alarm for 8am which wasn’t too early but was early enough considering I was on holiday and relaxing. Pinch Punch 1st Day Of The Month. December has begun and I wanted to start the month running. At 8am I woke up as planned and started getting ready to run. As I left the villa trying to find GPS for my *TomTom watch I noticed It was warm but a comfortable temperature. I was only planning to run 2 miles and due to having ran along the sea front the day before. I decided to run in the opposite direction for 1 mile before turning around. Yet again pacing was steady and the run seemed effortless, so much so that a running selfie was order of the day. I don’t know what had happened but somewhere on this holiday I had found my running mojo. For the first time since I signed up for Brighton marathon I was actually looking forward to the months of training ahead. The pieces were finally coming together. The timing was perfect as my training plan was due to start in two more days time. I spent the rest of the day feeling glad that I had done my exercise and the rest of the day is still ahead of me. At home I usually run in the afternoon or evening after work which I may now need to reconsider. I had decided the next day should be a rest day so I can start my training with a rest day. I am following my 19 week marathon plan which starts with a 3 mile run. Start Of The Training Plan. My marathon training plan begun on my final full day in Lanzarote. The distance was only 3 Miles I ran in the same direction as my previous run. The aim was to reach the lighthouse and have a slow walk back as a cool-down. After the success of my previous morning run I woke up earlier than usual and ran in the direction of the lighthouse. When I started running my right hamstring was tight. I knew from my previous running that this will usually stretch out after the first mile. Because of this I decided to run at a comfortable effort level. I need to do a maximum heart rate workout at one point to assist me with running. my watch only said 2.5 miles. I proceeded to run up and down the road leading to the lighthouse. With the aim to make up the miles on my *GPS watch. I made it I was so happy and celebrated accordingly. First Brighton Marathon Training Run Complete. With my first Brighton marathon training run completed I felt full of so much positive energy. Helped by the fact that my *GPS watch showed that all my splits were only 1 second apart. I also managed to finish with a negative split. From running while on holiday I have learnt a lot. First of all how much more enjoyable running can be when running with other people. I enjoyed running with ‘Lady JJ Miles’ so much even though at sometimes I didn’t want to talk. It was nice to have someone with me to talk to if I wanted to. In the past I have never ran more than twice whilst on holiday. Running in a place I do not know every run felt like an adventure. I am to take this back into my running at home. I will run along new routes and in new places so more of my runs feel like adventures. This Holiday came at a perfect time for me. Running on holiday is exactly what was needed to start training for Brighton marathon on the right foot. Thankfully this time running was holiday ended a lot better than my last blog post about running on Holiday.